I've been employing a stack of magazines, a Zara delivery box, and a wooden tray all piled up together as a bedside table for the past several months. I honestly could talk for ages about why I don't have an actual table there and why I've left my lamp vicariously stand on this tower of doom but the point is I ended up liking the look and have been looking to add another unconventional "bedside table". Here are some of the images I've been looking through for inspiration. This first room left a lasting impression, it honestly makes me so happy to look at. 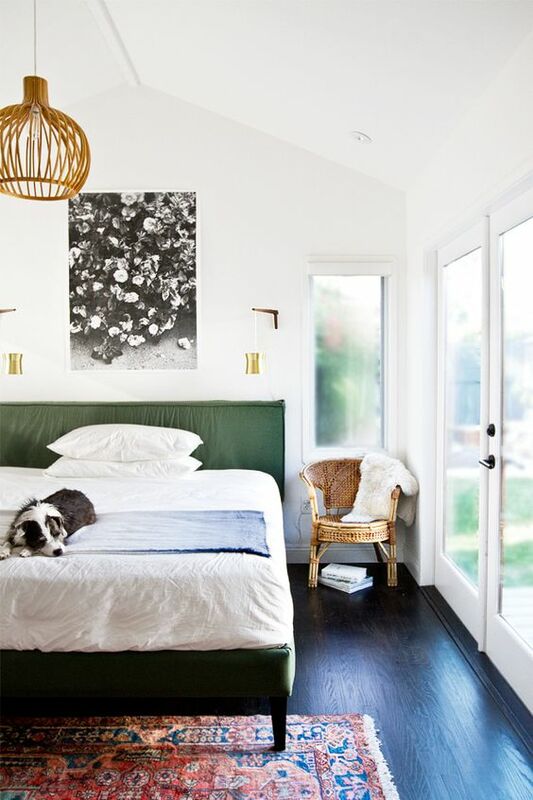 It feels like summer to me, and I think this is thanks to the wicker chair and the ceiling lamp, as well as the color palette of the bed and the lightness of the glass doors. 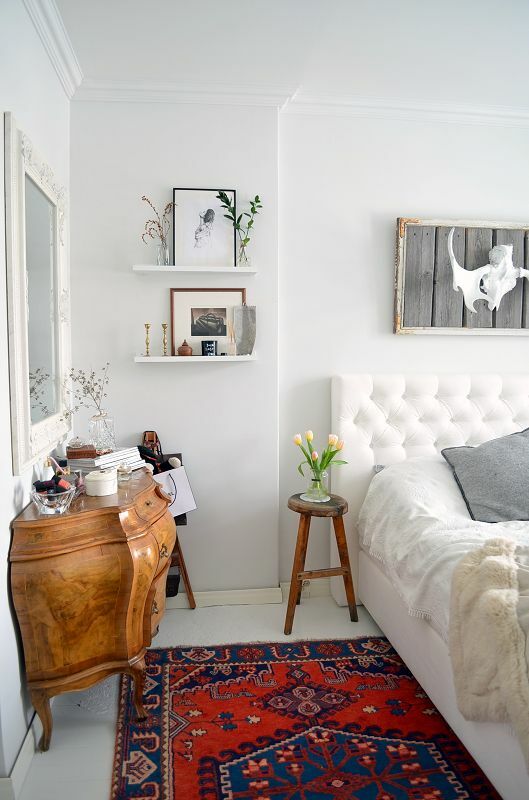 On the other hand, the rug, the throw, the slight wrinkle in the sheets make it also feel very intimate and cozy. Not to mention the dog! 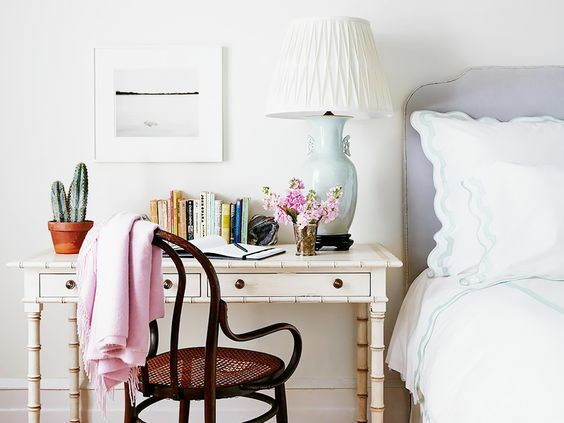 Naturally, the chair beside the bed is my focus here, it's a styling strategy that I've been enjoying. Although I think in this instance, the room isn't complete yet so it might be a temporary there. I quite like it though, they're personal and inviting in my opinion. I've included this image in a post before actually, because the styling is so beautiful. 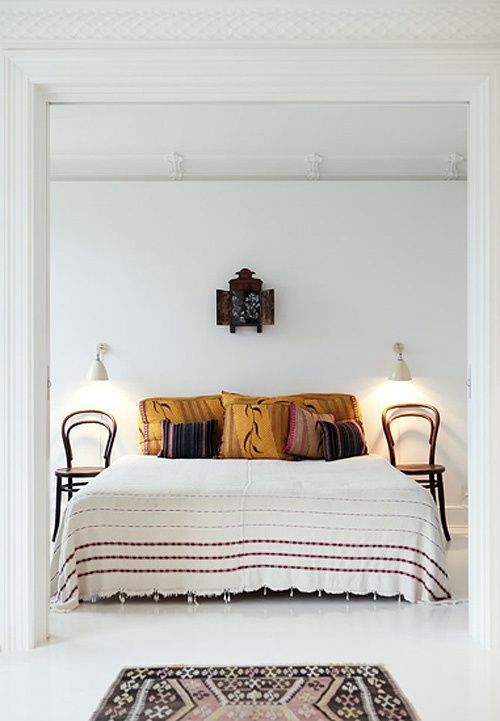 I'm not sure I could pull this off with the space in my room, but a little rearranging might work wonders. Again, the chair does something for the space I think. I can't quite put my finger on why that is, but I'm undoubtedly a bit obsessed. I found this photo just last night while putting together the links for this post. I almost bought yellow tulips a few days ago and I think that's what caught my eye. Although there isn't much space on the stool in terms of its practicality as a side table, I still think its a darling replacement. Lastly, an example with more symmetry (queue the fanfare) using chairs. I am really enjoying the chair motif, I couldn't help myself.